T.Muralidharan is one of India’s top recruiters and career columnists. A graduate of IIT Chennai and IIM, Ahemadabad he is an entrepreneur and founder-chairman of TMI groups, one of the top five recruiting firms in India. In his first book he has written about job seekers going for the first available job and regret joining it within months. The book identifies job roles that will create nearly 2 million vacancies for freshers by 2022. 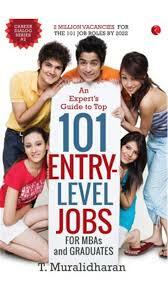 The main purpose of the book is to make readers familiar with the 101 top entry level job roles. I being a fresher could relate to most of the book. The book has various sections and each section explained in detail. The book helps the graduates from streams like BE,BTech,BA,BCom,BSc,BBA ,BCA,etc. Hardly have I found any book which has a detailed job description of each of these 101 jobs along with the expert’s opinion from a person experienced in the job under discussion. Also aiming to make the reader understand the job roles in the context and explains how each organization work. The book is unlike the many books I have read under this genre because the author goes beyond just listing out the top level jobs and then a mundane listing of the salary and where to acquire the skills, etc. The book speaks of the rich knowledge the author possess in job creation. The author writes about the responsibilities a person will have under that job, how the industry works which I feel is so important because people perceive a dream job without knowing what they are up to. The author also lists out the stress level,skills required and future career prospects. It is a gold mine filled with practical insights and contemporary data. The links listed out in the book is highly resourceful. Thoroughly researched and a perfect guide to all the freshers and final year students.